Is the biggest social networking site ever becoming too tough to navigate? Facebook is a free service so pretty much whatever they throw at you should be humbly accepted, appreciated, and there is nothing you can do about it. Or is there? Today is your lucky day my confused over-widgeted facebook addict friends because we have found a solution. It's a browser extension called Social Fixer formerly Better Facebook. 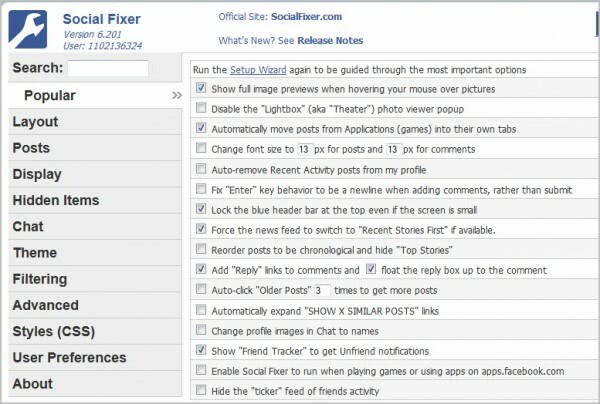 The Social Fixer browser application reduces the current cluttered appearance of Facebook and only shows what you want to see. It gives you the ability to hide posts you have already seen and allows you to quickly block any unpleasant images or unnerving comments by simply setting filters. This way you do not have to unfriend people for posting one or two too many annoying posts. They even offer customized themes or skins more suited to your style. To quote Social Fixer's inventor Matt Kruse "it's an extension meant to remove annoyances and add functionality" to your Facebook experience. Kruse invented Social Fixer in 2009 after he became annoyed at constantly seeing posts he had already read. It was originally created for Firefox browsers but it's now available on all major browsers worth having.